Bring the Industry’s Top Experts to Your Firm for Training Sessions! Our group study “lunch and learn” videos deliver timely news and in-depth analysis for better risk management while allowing your team members to earn CPE credits. Save when you subscribe to more than one topical report! Click above to see savings options for each CPE Network report. 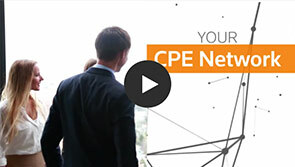 Act now and fill out the form to receive your Free CPE Network demo and see for yourself why more organizations choose CPE Network than any other firm-wide training program! This DVD offers expert insights into today’s most important industry topics, empowering your staff with the essential knowledge they need to protect your firm and your clients as well as the opportunity to earn group live CPE credits. To order now, call our sales team at 800.231.1860.